“The Path of the Goat” is a historical tour designed for visitors interested in Dominican 20th century history. The cultural tour will walk participants through the 30-year dictatorship of Rafael Leonidas Trujillo (1930-1961), the region’s cruelest dictator. The three-hour tour is carried out in automobiles from the fifties, which will take the visitor to the places visited by the tyrant hours before he was assassinated on the evening of May 30, 1961. The name of the tour takes on the tyrant’s local nickname, “The Goat” and is organized by the Dominican Tourism Competitiveness Council (CDCT) and the United States Agency for International Development (USAID). Visitors are transported on the three-hour long tour on automobiles from the fifties and sixties. All tours are accompanied by trained guides. Tour schedules are Saturdays and Sundays, from 9:00 a.m. to 12:00 p.m., and from 2:00 to 5:00 p.m. The tour begins at the “Avenida del Puerto,” the seaside avenue on Santo Domingo’s colonial city. Cars from the fifties and sixties await the visitors, driven by chauffeurs dressed in period uniforms. First stop: In order to give tour participants a more comprehensive view of the Trujillo dictatorship, the tour begins at the Museum of Dominican Resistance, in the Colonial Section. The museum features an overview of the dictatorship. Second stop: Visit the Juan Tomas Diaz and Antonio de la Maza Plaza. These two men organized the group that assassinated the dictator. To introduce participants to the Trujillo era, the route begins at the Memorial Museum of Dominican Resistance, dedicated to those who fought against the dictatorship. Because of its historical value, the museum was declared “Patrimony of the World” by UNESCO. Third stop: The Presidential Palace, built by the tyrant. A tour of the Palace is included. Fourth stop: The “Plaza de la Cultura,” where the dictator’s official residence once stood. The Plaza is now home to the National Theatre, National Library, Museum of Modern Art and other cultural institutions. Fifth stop: Visit to another of the dictator’s 37 residences, which is now home to the Ministry of Foreign Affairs. Sixth stop: Mausoleum of the Heroes of Constanza, Maimon and Estero Hondo. This is the tomb where the remains of the men who carried out a guerrilla expedition to overthrow the dictator in 1959 were laid to rest. Seventh stop: Visit to the area where Trujillo built his “World’s Fair,” and which showed the world the many “successes” of the dictatorship. Eighth stop: Visit the monument built in the site where Trujillo was actually shot and killed. The monument is situated on George Washington Avenue, the capital city’s seaside boulevard. I understand that you are an avid fisherman, and I would like to tell you a little about this island and living on the north coast of the Dominican Republic. We live in a beautiful residential community on the Dominican Republic north coast called Sea Horse Ranch. This is, quite simply, the best place of its kind on this side of the island, a place of quiet elegance and enough amenities to satisfy most people. Our international airport is 15 minutes away with daily service to Europe and all of North America, and the restaurants, shops, and nightlife of Cabarete/Sosua are diverse and fun. I enjoy river and reef fishing as well as deep-sea. The rivers and lagoons of this coast are teeming with snook up to 20 lbs and we see tarpon in certain months, usually in the 30-50 lb range (though larger ones have been reported). I like to cast a salt-water fly for snapper and small grouper around coral heads in the early morning calm. In addition to the fishing, the north coast offers easy access to the Turks and Caicos islands, just 90 miles away. 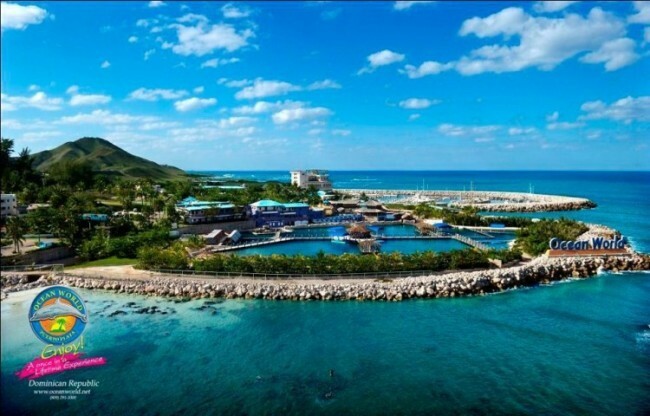 5-6 hours at cruising speed in most sports fishermen will have you in Grand Turk and another 2 hours will see you at Provo, you undoubtedly know how great the diving is there. Just beyond T&C lie the 700 islands of the Bahamas. It is an easy run of just a few days to S Florida, stopping for fuel at conveniently-spaced marinas. Or take a week and drive the walls at Samana Cay and the forest of giant heads NE of conception Island. There is nowhere I can think of that has such a great balance of lifestyle, natural beauty and close-by fishing of almost every kind. In addition, the people of the Dominican Republic are friendly, eager to laugh and smile. That fact alone decided me, after a lifetime cruising and experiencing the various Caribbean islands, to make my home here. 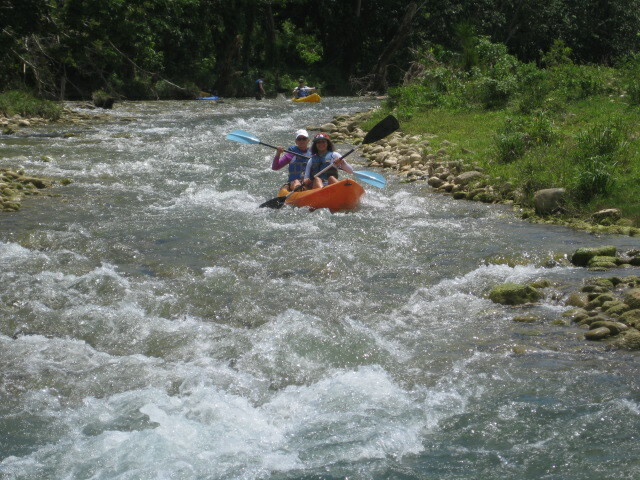 This past weekend, we went kayaking down the Yasica River. 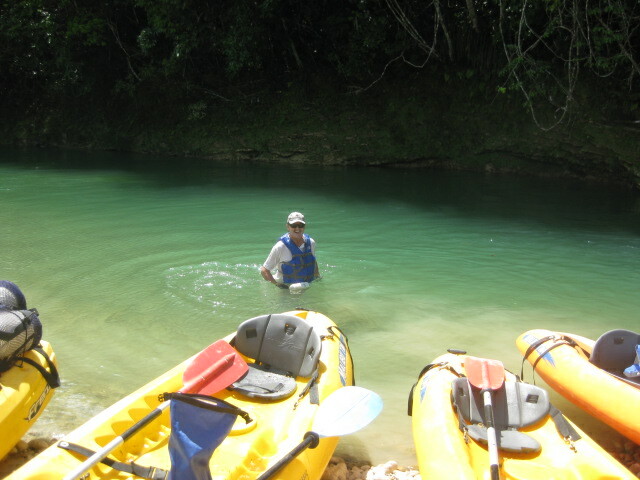 The clear green water was refreshingly cool, and in 12 miles on the river, we saw only 2 houses. Last week, we ate fresh snook caught nearby. A couple of weeks ago, we drove with our kids to Las Terrenas and Samana where I sailed in a regatta. My wife has several horses here at Sea Horse Ranch Equestrian Center and both she and her daughter ride on the beach and through the coastal forests often. I walk our dogs to a nearby beach every morning and watch as snorkelers, surfers and stand-up paddle-boarders work the reef just offshore. A couple of weeks ago we had a great night of jazz at the Sea Horse Ranch Beach Club and on that same weekend were held both the national surfing championships and the annual kiteboarding event…..I mention these things to you to illustrate how full our lives are here.